I’ve been trying to find information to promote Elisabeth Leseur and this is what I found today in my search. I’m thinking this would be a great book to purchase as it’s not too expensive and it’s story line I could relate to… if you’re interested below is a link just underneath this picture and it is the least expensive that I have found so far. Let us know if you find something less costly. 🙂 Enjoy! Single, married, widowed, separated, abandoned, divorced… Childless, an unwed mother, a parent of many children, a stepmother… Born into high society, a member of the middle class, destitute… From Asia, Europe, Africa, Australia, the Americas. None of the accounts in Saintly Women of Modern Times is a fairy tale, but each woman ended up finding a Prince who loved her completely, a Prince who had been calling to her even as she had been searching for Him. Each of these twentieth-century laywomen fell deeply in love with Christ, the Prince of Peace, and that made all the difference in the world — the difference in this world, and the next. Pick a chapter — any chapter — and you’ll want to read another and another and another. Here are the women who prove that — no matter the circumstances — a life of heroic virtue is possible. A life that centers on Our Lord and His Blessed Mother, a life of sanctity and of service to others. 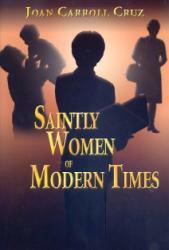 This entry was posted in Uncategorized and tagged Elisabeth Leseur, Saintly Women by t garcia. Bookmark the permalink.